WESTBURY, N.Y., August 28, 2018	(Newswire.com) - Nature’s Edge®, a woman-owned business whose products are proudly made in the USA announces the release of their newest supplement: Quell-Gel™. Combining clinically tested plant and ocean ingredients into one robust supplement, Nature’s Edge® created a product that supports the body’s natural inflammation response (1). This comes at a vital time in medicine. Recently, researchers have realized the negative effects of inflammation that expand beyond the initial symptom. It is believed that inflammation causes many common ailments ranging from rheumatoid arthritis to certain types of cancer. While inflammation is a natural response to stress, the higher levels of stress and inflammation in today’s world have led to a breeding ground for diseases. This inflammation can affect a broad range of individuals. People who have arthritis or certain types of autoimmune diseases, like rheumatoid arthritis or psoriasis, should look into how Quell-Gel™ could benefit their lifestyle. This extends to athletes as well. For those with an increased level of activity, frequent inflammation can be the first sign of more injuries to come. Even if people just take Advil, Ibuprofen, or any other NSAID, they should compare those medications to Quell-Gel™ softgel capsules. Born from natural and strategic ingredients, this proprietary formula is science-based. Quell-Gel™aids in the body’s natural inflammation response and is designed for maximum absorption into the body(2). 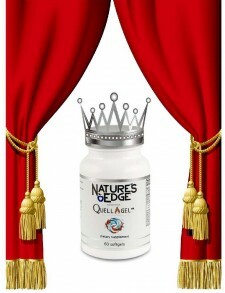 To learn more about how Nature’s Edge® Quell-Gel™ can help your body, head to naturesedge.com or dial 1-833-GO2EDGE. To purchase your natural anti-inflammatory supplements, search Amazon or Nature’s Edge® website. And right now, Nature’s Edge® pledges 10 cents of each bottle sold to an affiliate organization such as American Heart Association, American Diabetes Association, and Arthritis Foundation. Nature's Edge®, a woman-owned business whose products are proudly made in the USA announces the release of their newest supplement: Quell-Gel™.